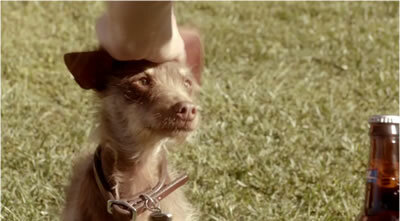 Beer maker Anheuser-Busch released a teaser for the Bud Light Super Bowl 2012 commercial titled Rescue Dog Weego. Calling this dog's name unveils a special trick. Watch the teaser video now below. Watch fully released Bud Light Super Bowl 2012 Ad - Weego now. There will be another Bud Light Super Bowl 2012 ad, but that one is still a secret. Anheuser-Busch has bought 4:30 minutes of advertising time during the Super Bowl 2012. Again the beer giant is one of the biggest Super Bowl advertisers. Anheuser-Busch has now released teaser videos of all Budweiser Super Bowl 2012 commercials. Find them all on Super Bowl Ads for Geeks. See also the new very cute Bud Light Weego Ad teaser.